Thanks for the links to the great calendars! I don’t think your workspace is that messy! sorry hun, just done DD’s 21st on Monday so I know how busy you can be!!! Nothing shocking in my opinion. Just very cute calender sheets. I think your calendars are beautiful! And how neat that brother could be there virtually. Technology never ceases to amaze me. No, I tried brayering onto the folders directly but it foen’t work as well. I just brayer (with a light touch) over the embossed card. boy you were up early to get in first!! Love the calendar’s and your blog. Your desk looks great to me! At least there is something happening there, I wish I could say the same! That’s wonderful that you got to do the virtual birthday party. 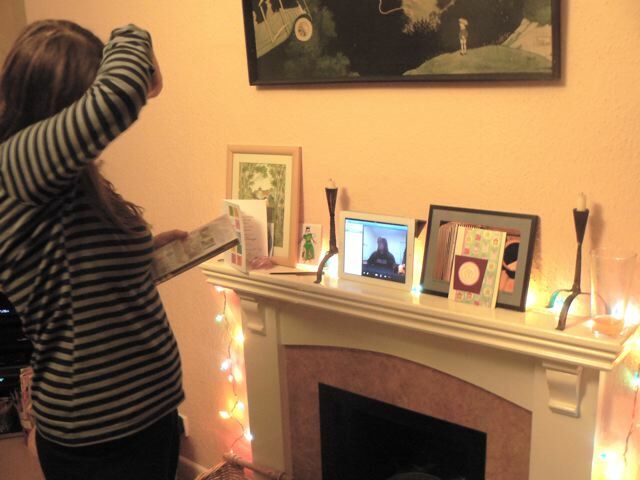 Those calendars look great, thanks for sharing! Isn’t technology wonderful for keeping families together? I love your creative desk and those calendars are going to be stunning! Happy Birthday to your DD. Hope she has a wonderful time, spending her birthday money. It is the birthday of our DD too, so we are off to see her this afternoon, where we shall probably see Shaz Silverwolf, who is her mother-in-law. Isn’t technology wonderful! Hope she had an amazing day. I love how your calendars are turning out, beautiful, vibrant colours! Happy birthday to DD and it’s so great to be able to Skype and keep in touch like that. Your desk looks great, so creatively busy! I love the patterns on your calendars! Happy birthday DD!! Ah great pictures of your lovely Maddy and her bro – how marvellous that he could ‘be there’. Your desk looks great to me – whenever you say it’s covered in crap, I look and there is never the rubbish of torn papers and wet wipes that I accumulate. Am happy to see that you have a satellite table at home too – just like the crop! 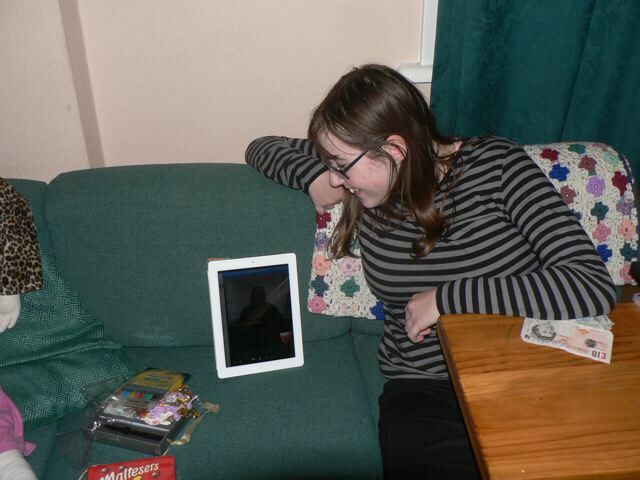 How nice – great that technology let’s us share! Enjoy your day together and get shopping! Thanks for sharing today! Sarah at 5. Looks like you are having loads of fun ….not messy at all …have fun shopping. Love the calendars and your creative workspace this week and pleased all the family got to share in your daughter’s birthday. You also taught me something – there are actually two 5 o’ clocks in a day – and here’s me thinking there is only the tea-time one. Birthdays are great aren’t they, my friend used to have two,as she was born on Christmas day, (years later she still insists on having two,which in my view makes her twice as old!! Great load of inks, Happy WOYWW! Great desk and i love facetime esp when my kiddies are at my mum and dads, my 18 month old can work it and loves seeing people, just he gets confused when people ring and he cant see them! Great looking calenders. Your desk is looking good from here. And oh how wonderful to be able to share a birthday via the internet. Isn’t the internet a wonderful thing? I love the way it can make us all seem so much closer. Great desk – love the calendars. Glad your DD enjoyed her birthday. Number One!! Have never managed it yet… there is always hope!! Happy Birthday to your 15 year old and I love the idea of having a virtual brother enjoying it with her ( I have three brothers and the idea of them being about only virtually is somewhat appealing)!! LOL! I don’t sleep much and am totally an earlybird. Since I sleep with my iPad in easy reaching distance I just grab it as soon as my eyes open. Laugh, but I was actually playing solitaire for about an hour before I checked WOYWW. Just lucky today, as with every day I have been at 1. Love the virtual birthday party – and belated birthday wishes to your daughter. 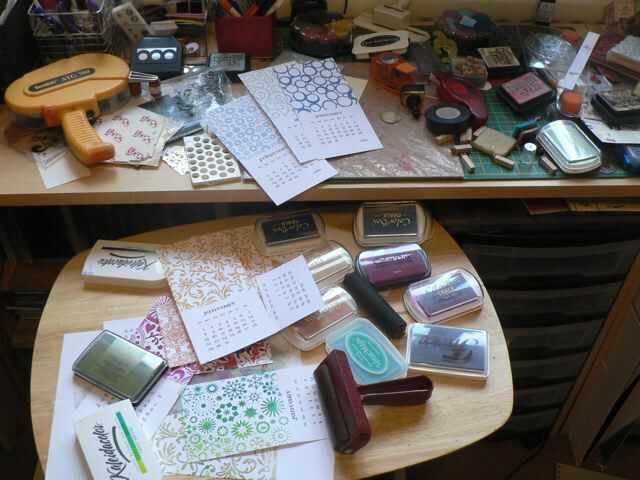 I think your desk looks very productive – I miss having my pull out desk in my craft room meant I could double up with the clutter! Have a great day shopping. What wonderful calendars those are going to be! Birthday’s are fun but birthday presents are even better! Just had my DD birthday… and a birthday bash with over 20 young people – mostly teens ARGH!!! How sweet that you had a ‘virtual son’ for the day, especially there for his sister… that’s true brotherly love! i actually think your desk is in order. shocking, i know! Wow! love the calenders.. and I love birthdays too! got my DD’s today lunch and a shop in Covent Garden!